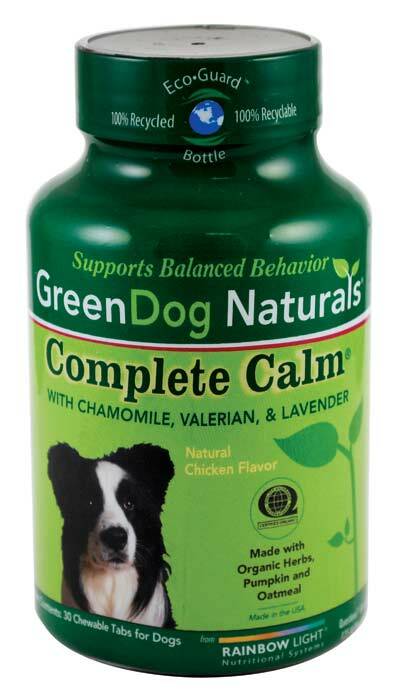 Complete Calm Chewable tablets can help reduce hyperactivity and support calm during periods of stress like separation, visits to the vet, thunderstorms and fireworks and even transition to a new home. Made with organic herbs, pumpkin, and oatmeal, this organic solution supports overall balanced behavior to make stressful situations easier and more tolerable for your dog (and you). It's also free of binders, fillers, and refined sugar and has a natural chicken flavor dogs will love. Each Complete Calm tablet contains 450 milligrams of a calming complex with organic herbs, including chamomile, lavender, passionflower, valerian, and marshmallow. These ingredients work together to help soothe the nervous system. Ginger, alfalfa, apple, brown rice protein, oatmeal, and pumpkin provide nutrients to support digestion and soothe nervous tummies. This supplement is manufactured in the U.S. in a certified organic, GMP- and FDA-compliant facility and is approved by the National Animal Supplement Council. It comes in 100 percent recycled, BPA-free EcoGuard bottles, reducing packaging carbon footprint by 92 percent. Complete Calm contains no wheat, soy, corn, artificial colors or flavors, preservatives, fillers, binders, excipients, added salt, or refined sugar. It is certified organic by Quality Assurance International. Give one tablet per 25 pounds of body weight; 1/2 chew for dogs under 25 pounds. 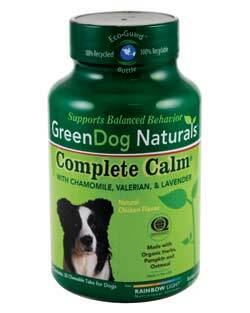 Complete Calm may be administered up to twice daily and is safe for daily use. Begin at 1/2 dose for one to three days and increase to full dose for desired effect. Complete Calm Chew (30 Tablets). 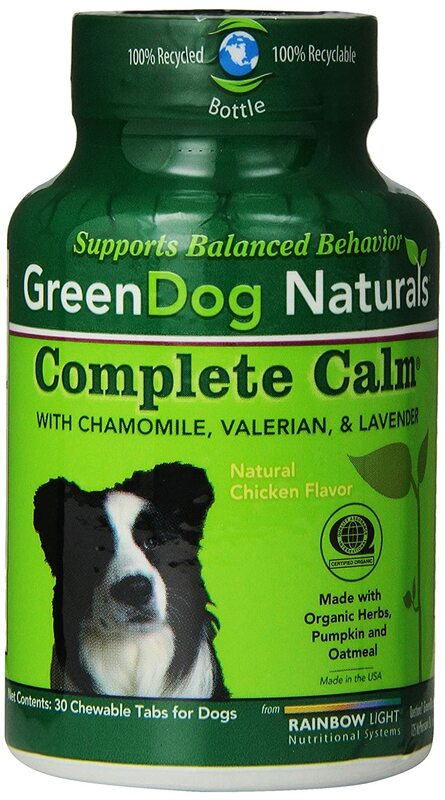 Complete calm chewable: recommended to help maintain calm and relaxation during separation, car rides, visits to the vet and groomer, transition to a new home and loud noises.